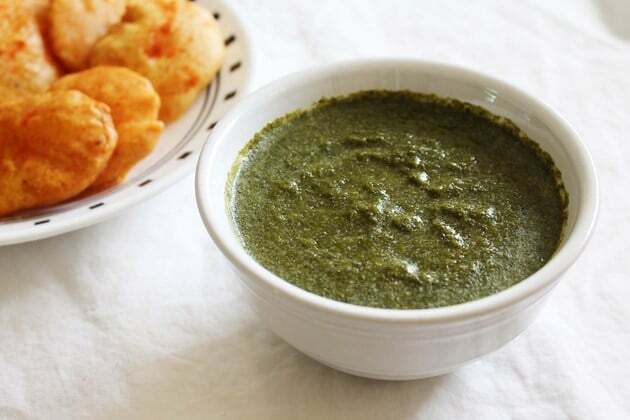 Mint chutney or pudina chutney recipe – it is made from fresh mint leaves, coriander leaves, green chili, onion and ginger. This is simple, quick to make chutney recipe. This can be ready in only 10 minutes. Just add all the ingredients into the blender and make smooth paste. That’s it. You are done. Many prefers to call this a ‘green chutney’ just because its color is green. This is also known as mint coriander chutney as well. Shelf life: This mint chutney can be kept up to a week in airtight container in refrigerator. Or you can freeze it in small containers or in ice cube trays for later use. 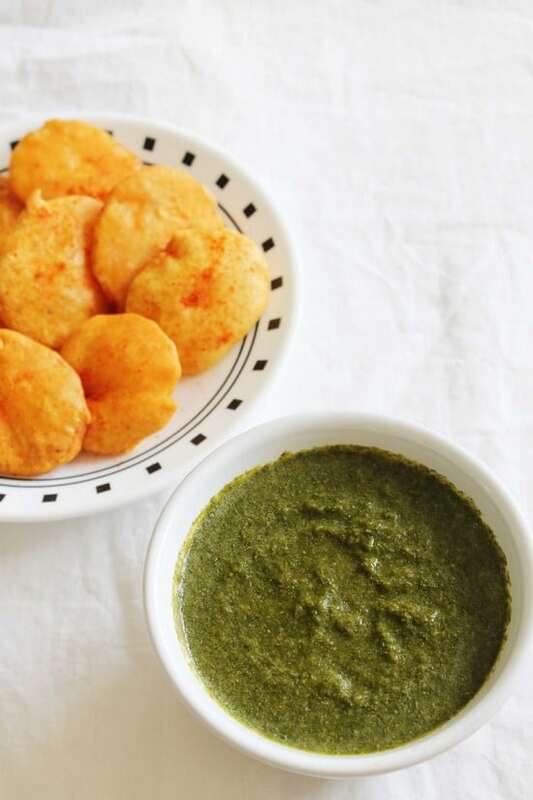 Serving suggestion: This can be served as a dipping sauce for pakora, samosa, vada and cutlets/tikki or use it in any chaat recipes like sev puri, papdi chaat, ragda patties that calls for green chutney. It can be spread-ed to the bread slices for sandwiches. Or drizzle over the paneer tikka or tandoori aloo. Some people like to have it as an accompaniment to their lunch or dinner. Because of the mint leaves in it, this pudina chutney has refreshing flavors. And the aroma of the mint leaves, ahha just awesome. I have added little onion in the chutney. It gives body and texture to the chutney as well as adds good flavor to it. I like spicy food, so I have added more green chilies, you can adjust it as per your liking spiciness. Addition of lemon juice is must in this chutney, please do not skip that. The day I made this chutney, I have served with aloo pakora. The leftovers, I have used in sandwiches next day. Wash mint leaves and cilantro leaves well. Take all the ingredients into the blender. And blend it well it gets smooth and pureed. Add very little water while grinding the chutney only if needed. I have added only 2-3 tablespoons of water while grinding. QUICK TIP: adjust the consistency later. For example, if making for sandwiches then you want thick chutney. If making for chaat then you want little thin, runny chutney. So add water and make preferred consistency. Remove it to serving bowl or if not serving right away then keep in airtight container in refrigerator. Helo Kanan do u have the receipe for home made marinades? I do buy them from the spice shops n they are expensive . As I use it everyday to cook curries as I’m vegetarian n I’ve found that the curries are just too gud to have just 1 helping!!! I’ve tried all the varieties n it all adds a lot of flavour to the food.so if u could plz let me know how I can make them at home It would be much appreciated! Hi Raksha, I am confused that what recipe you are looking for marinade for veggies or curry powder?? anyways, if looking for marinade recipe for veggies then go to paneer tikka recipe and you will find marinade ingredients. If looking for curry powder than I found this recipe click here though I have not tried it but reviews are good there. I usually add regular spices (coriander powder, cumin powder, turmeric powder, red chili powder) while making veg curry for everyday basis. not any fancy. and still you don’t find the answer then please clarify me that exactly which recipe you are looking for.